Arsenopalladinite: Mineral information, data and localities. Yellowish, creamy white in reflected light. Likely polymorphous with stillwaterite. 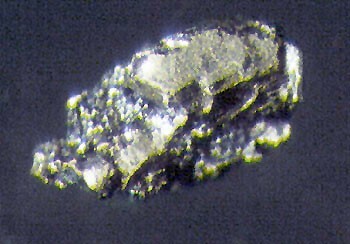 One of several Pd arsenide minerals, comparable to, e.g., isomertieite, Unnamed (Pd Arsenide). Graph shows reflectance levels at different wavelengths (in nm). Top of box is 100%. Peak reflectance is 60.0%. The Natural History Museum, London, England, 1934,72, 1977,258; Royal Ontario Museum, Toronto, Canada, M34726; National Museum of Natural History, Washington, D.C., USA, 142504. Isomertieite 1 photo of Arsenopalladinite associated with Isomertieite on mindat.org. Gold 1 photo of Arsenopalladinite associated with Gold on mindat.org. Bornite 1 photo of Arsenopalladinite associated with Bornite on mindat.org. Palladinite 1 photo of Arsenopalladinite associated with Palladinite on mindat.org. Fleischer, M. (1974) New mineral names. American Mineralogist: 59: 1330-1332. Clark, A.M., Criddle, A.J., Fejer, E.E. (1974) Palladium arsenide–antimonides from Itabira, Minas Gerais, Brazil. Mineralogical Magazine: 39: 528-543. Cabri, L.J., Clark, A.M., Chen, T.T. 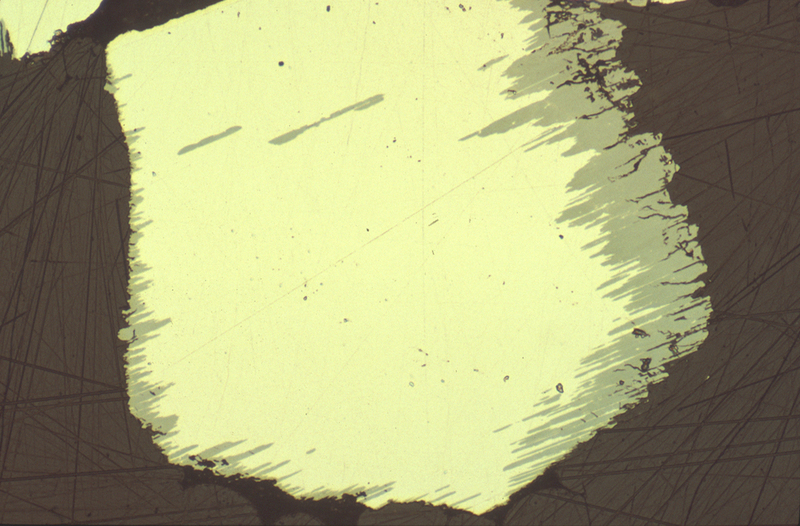 (1977) Arsenopalladinite from Itabira, Brazil, and from the Stillwater Complex, Montana. The Canadian Mineralogist: 15: 70-73. Olivo, G.R., Gauthier, M. (1995) Palladium Minerals from the Cauê Iron Mine, Itabira District, Minas Gerais, Brazil. Mineralogical Magazine: 59: 455-463. Huanbin Song, Mingqin He, Shangzhong Zhang, and Fenghuang Yi (2008): Chinese Journal of Geochemistry 27, 104-108. Guice, G. L., Törmänen, T., Karykowski, B. T., Johanson, B., & Lahaye, Y. (2017). Precious metal mineralisation in the Sotkavaara Intrusion, northern Finland: Peak Pt, Pd, Au and Cu offsets in a small intrusion with poorly-developed magmatic layering. Ore Geology Reviews, 89, 701-718. Devaraju, T. C., Alapieti, T. T., & Kaukonen, R. J. (2005). SEM-EDS Study of the Platinum-Group Minerals in the PGE Mineralized Hanumalapura Segment of the Layered Mafic-Ultramafic Complex of Channagifu, Davangere District, Karnataka. Geological Society of India, 65(6), 745-752.